Dorothy F. “Dot” Loving (nee Hurwitz), age 79, of Swarthmore, PA, passed away on March 17, 2019. Born in Philadelphia, PA, she was the daughter of the late Abe Hurwitz and Harriet Mae Hurwitz (nee Dyson). 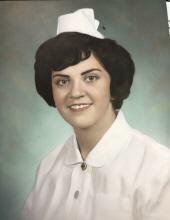 Dot had been employed as a Nurse at Delaware County Memorial Hospital in Drexel Hill, PA. She also was involved in the Parish Nursing Volunteer program. Dot loved being a mom and wife. She adored her grandson. She loved to cook and sew and spend time at her beach home in The Villas. She was a great neighbor and community minded. She was very involved at the Garden Church, and with any organization that involved her family. Dot was predeceased by her beloved husband, George C. Loving. Even after George’s death, she remained faithful to him and his memory. She is survived by her dear children Beth Ann Loving (George) and George Charles Loving, Jr. (Amy). Grandmother of George C. Loving, III. Sister of Benjamin Hurwitz and the late George Hurwitz and Emma Young. Interment: Arlington Cemetery, Drexel Hill, PA. In lieu of flowers, contributions to a charity of the donor’s choice in Dot’s memory would be appreciated.